The figure used for this unit is a Raphael figure from the TMNT My Busy Books set. Its model number and name are #001, 102 / Raphael. Character Bio - Raphael, after falling into the ooze, was separated from the rest when a stray cat named Hob tried to carry him off. Raphael mutated into his humanoid form and lived on the streets for many months until his brothers found him. 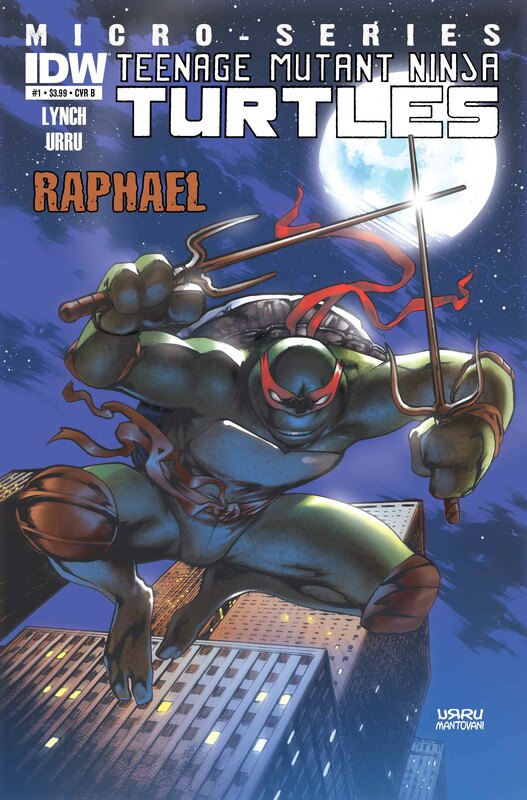 Raphael is the most aggressive and impulsive of the turtles. Q: When I reveal an Order Marker on a card, and all the figures on that card have been destroyed, am I still supposed to roll for Self Importance? A: No, because the rule book says that you may not "reveal" Order Markers on cards that have all of its figures destroyed. Those Turn Order Markers are "lost". As a Ninja, Raphael has these Ninja Synergies. As a Ninja Turtle, Raphael may be activated by Leonardo's Turtle Power special power. Last edited by quozl; January 15th, 2018 at 07:31 PM. Whenever you reveal a numbered Order Marker on any other Army Card you control, before using any other special powers, you must immediately roll the 20-sided die. If you roll 20 or higher, you must take an immediate turn with Raphael, and you may not take any additional turns with other figures you control. When using Self Importance, add 2 spaces to Raphael's Stealth Leap movement for that turn. You may only roll for Self Importance once per Order Marker. When Raphael attacks, he may attack one additional time. Add 1 to Raphael's Self Importance roll for each Unique Hero you control with one or more wounds and 1 for each destroyed Unique Hero in your army. When Raphael takes a turn with Self Importance, he may take one additional turn. Instead of his normal move, Raphael may use Stealth Leap. Stealth Leap has a move of 3. When counting spaces for Stealth Leap, ignore elevations. Raphael may leap over water without stopping, leap over figures without becoming engaged, and leap over obstacles such as ruins. Raphael may not leap more than 12 levels up or down in a single leap. When using Stealth Leap, Raphael will not take any leaving engagement attacks. Last edited by quozl; December 22nd, 2016 at 02:54 PM. Last edited by quozl; April 9th, 2014 at 10:09 PM. Have you seen my latest Leonardo post in the faction thread? Looks good! I think it needs a few tweaks, though. Right now he plays similar to Starfire. Probably should be a cap on his Vengenace like Starfire, but he also doesn't have range, so it wouldn't be as important, might be okay. We should rename Self-Imporatance because it has the clause about stealth leap. Maybe something with Recklessness, or Insubordination? I also still like the original classes (Fighter here), and Turtle as race. I have some Yakuza designs planned that will synergize with Ninja, so it'd be kind of weird here, but not a deal breaker. If we end up cutting Stealth Leap, do we want to replace it with something or no? I think either Counter Strike or Ruthless Counter Strike seem to fit him. No need to rename Self Importance. We did the same sort of thing with Superspeed. I think MUTANT TURTLE is good for species. I didn't realize Penguin added to his movement, I thought that was added here. Carry on! Seems like we have to really lock down a few things for the whole faction - I posted a poll in the faction thread. If he stays as is in power set, where do you see his cost coming in at, quozl? Oh, yeah, and Righteous Vengeance definitely should have a cap on it. Right now, he could choose Anti-Monitor and attack 20 times or so. Before attacking with Starfire, you may choose one other Unique Titan or Sidekick Hero you control within 4 clear sight spaces of Starfire. After Starfire attacks, she may attack one additional time for each Wound Marker on the chosen figure's Army Card, up to a maximum of three additional attacks in a single turn. I've always found Protective Fury pretty strong, but without Range, it might not be quite so strong on Raphael. I've never cared for Self-Importance (it's a really annoying power to play with), but I trust you guys if it fits the character.